In 1849, the lure of gold brought Bartlett to California where he became a notable publisher. He sailed from Charleston, South Carolina that November and arrived in San Francisco. Bartlett brought a printing press with him and began publishing the Daily Journal of Commerce on January 23, 1850. It was the first daily newspaper on the west coast. Bartlett published several other newspapers including the Daily Evening News and the True Californian. In addition to newspapers, Bartlett also published books. He published the first English-language book ever printed in California, under the cumbersome title of California as It Is and as It May Be or a Guide to the Gold Region. 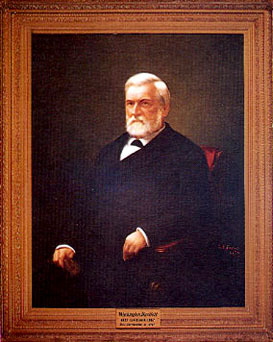 Bartlett served two terms as the San Francisco County Clerk, after which he practiced law with his brother, Columbus. In 1870, Governor Haight appointed Bartlett as the Harbor Commissioner—a post he held until 1871. Bartlett served as a California state senator from 1873 to 1877, followed by two terms as San Francisco’s mayor from 1882 to 1886. Bartlett was a life-long bachelor with a reputation for honesty. He suffered a severe stroke on August 23, 1887. He passed away three weeks later on September 12, 1887 after serving only nine months in office. Use the California State Library’s interactive tool to view Executive Orders and Proclamations signed by Governor Bartlett.